Natsuya is a Pokémon Ranger. 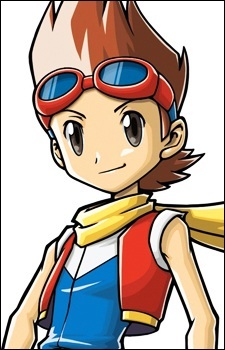 He is the male player character in Pokémon Ranger: Locus of Light. Natsuya made his debut in the game's anime special, SS022 (Pokemon Ranger:Hikari No Kiseki) where he attempted to stop the Pokémon Nappers from gaining control of other Pokémon. However, he was later attacked, which caused him to come crashing down to an island where the Ukulele Pichu was located. Natsuya made his debut appearance in the main series in DP169 where he was assigned to bring a rare Heatran that knows Eruption to a wild park for it's safety. He was also shown to have a very optimistic attitude, thanks to his grandfather's advice when he was younger. Eventually with the help of Ash and co., he managed to capture Heatran via his Capture Styler and helped it escape to safety.